BEVERLY HILLS, CA - August. Baseball season is in full swing. Barbecues have been blazing since Memorial Day. And fans can count another August tradition, when Anchor Bay Entertainment releases The Walking Dead: The Complete Fourth Season Blu-ray(TM) + Digital HD with Ultraviolet(TM) and DVD on August 26th. Each format contains five loaded discs, presenting each episode exactly as it was originally broadcast. The Blu-ray(TM) + Digital HD with Ultraviolet(TM) presents the episodes in pristine 1080p high-definition and lossless Dolby TrueHD 7.1 audio. As with previous season releases, The Walking Dead: The Complete Fourth Season rewards fans with hours of bonus features, including never-before-seen production footage, deleted scenes and audio commentaries, with ultra-exclusive content only available on the Blu-ray(TM) release, including additional audio commentaries and several "extended" episodes seen for the first time! Another "Walking Dead" home entertainment release tradition, started with the Season 2 Blu-ray(TM) set, is the unique concept packaging by renowned collectibles creator McFarlane Toys. 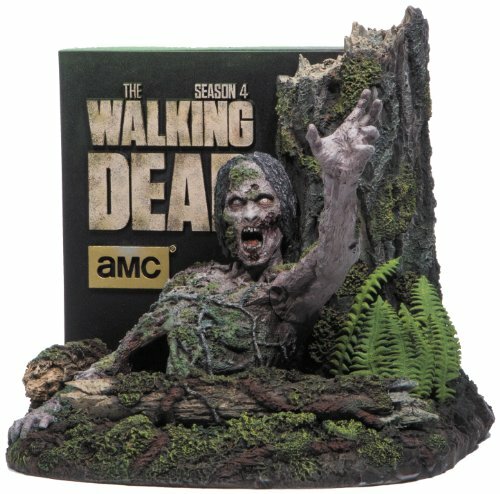 Following in the "shuffling" footsteps of Season 2's "Walker Head" and Season 3's "Walker Aquarium," The Walking Dead: The Complete Fourth Season will be available in a Blu-ray(TM) limited edition "Tree Walker" package. SRP is $79.99 for the Blu-ray(TM) + Digital HD with Ultraviolet(TM), $69.98 for the DVD and $129.99 for the Blu-ray(TM) limited edition. Pre-book is July 23rd. Based on the comic book series written by Robert Kirkman and published by Image Comics, AMC's "The Walking Dead" enjoyed its most popular season to date, averaging 13.3 million live/same day viewers per episode and 8.6 million adults 18-49. Whether evading walkers, resisting a super flu outbreak, escaping the fall of their temporary prison haven and desperately searching for a sanctuary called Terminus, the on-going story of a group of survivors under the protective watch and leadership of Rick Grimes (Andrew Lincoln) and Dr. Herschel Greene (Scott Wilson) continues to capture viewers' imaginations on a global scale. Whether commemorating favorite films from every genre and decade, or creating acclaimed original programming, AMC brings to its audience something deeper, something richer, Something More. The network reigns as the only cable network in history ever to win the Emmy(R) Award for Outstanding Drama Series four years in a row, and boasts the most-watched drama series in basic cable history with The Walking Dead. AMC's original drama series include Mad Men, Breaking Bad, The Walking Dead, Hell on Wheels, Turn, Halt and Catch Fire and the forthcoming Breaking Bad spinoff, Better Call Saul. AMC also explores authentic worlds with bold characters through its slate of unscripted original series like Comic Book Men, Small Town Security, Talking Dead, Game of Arms and Freakshow. AMC is owned and operated by AMC Networks Inc. and its sister networks include IFC, Sundance Channel, and WE tv. AMC is available across all platforms, including on-air, online, on demand and mobile. AMC: Something More.